Because Mr. Thin (the DMZ guide from the post before) was such a good guy, I accepted his offer to ride along with him to the Phong Nha-Ke Bang National Park. 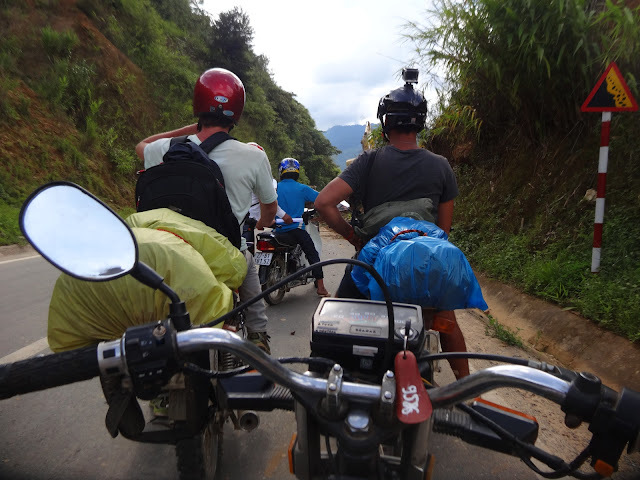 On the back-seat of his trusty Honda C90 (you always find a way to store your huge backpack...) we drove about 150km north-west of Dong Ha to the famous Kast mountain region of Phong Nha. 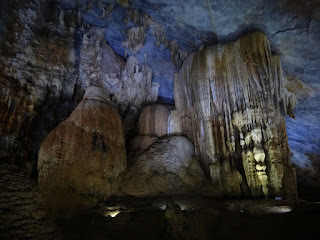 Phong Nha is not only a protected nature reserve but also a UNESCO World Heritage Site because of the impressive and unique cave systems that are widely spread inside and benath the many limestone mountains in the park. 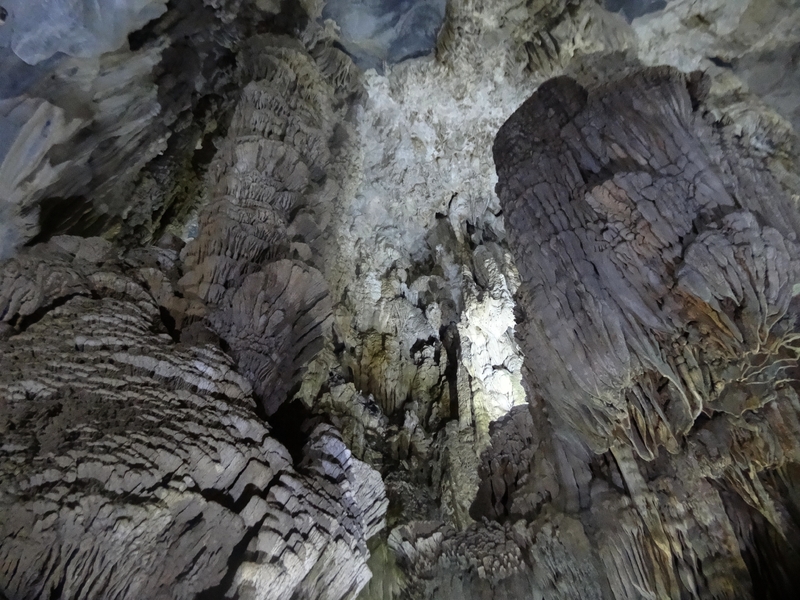 The site is also world-famous for having one of the world's largest limestone caves, the Sơn Đoòng cave. 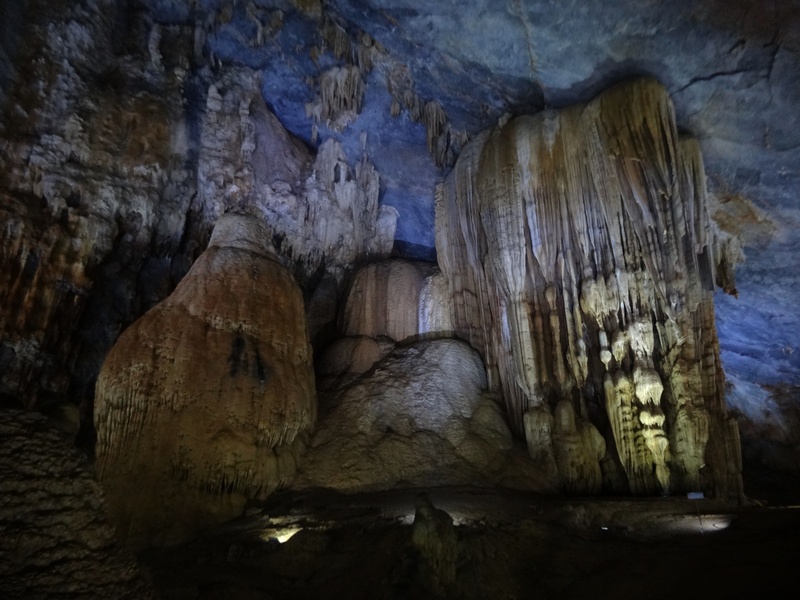 Just discovered in the recent years, so far only a limited number of people were able to visit the cave, since expeditions to the hardly accessible cave system are really expensive and only a handful of agencies are allowed to organize treks to Sơn Đoòng. 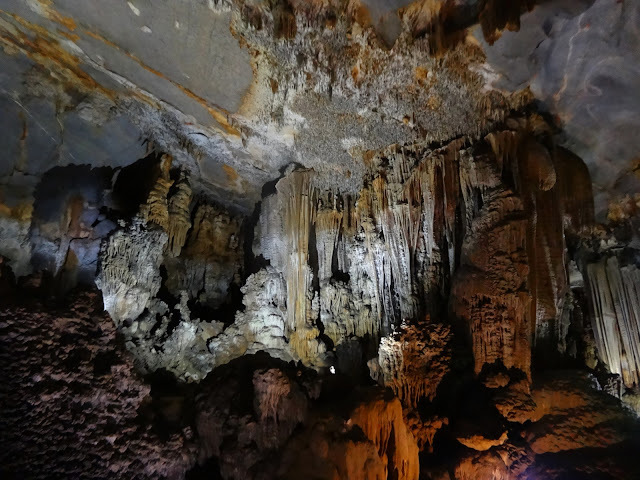 However there are plenty of other caves in the park that are opened for tourists, so there is certainly no lack of sightseeing options. 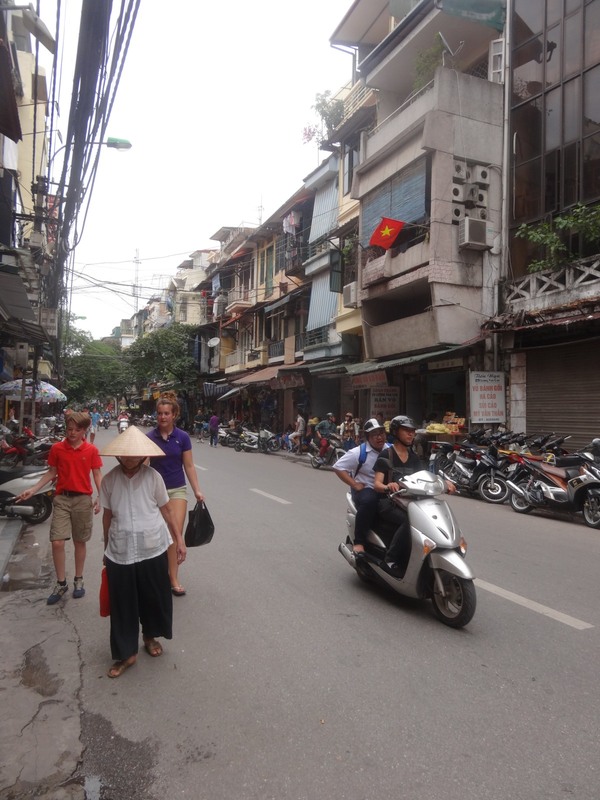 Right after Mr. Tinh stopped his scooter in the town, I hopped off and bid farewell to him. He was truly a cool guy and guide. 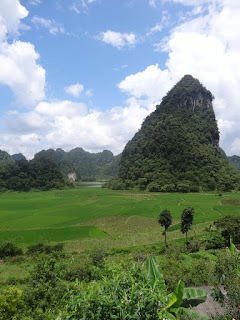 First of all I was really impressed by the welcoming karst mountains all around me. You definitely don't see them that much in Southern Vietnam! Even though Mr. Tinh recommended me a cheap Vietnamese guesthouse, I immediately checked-in in the local Easy Tiger Hostel, a typical Backpacker hostel with all its typical downsides and crowning moments. While the hostel itself was absolutely solid, I suddenly realized that until that very moment I almost always chose backpackers hostels as accomodation. If I already was bitching about backpackers in Koh Phangan and in pretty much every other touristic place in South East Asia so far, so why the hell did I even bother to go there at all and even to sleep in a typical $5 backpacker dormitory? 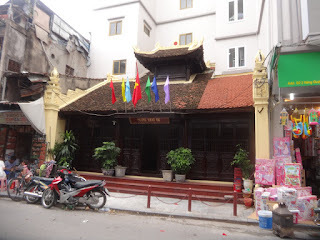 Why didn't I listen to Mr. Tinh and booked at a cheap and solid guesthouse for locals? Suddenly I started having self-doubts... Was I being hypocritical? Really? 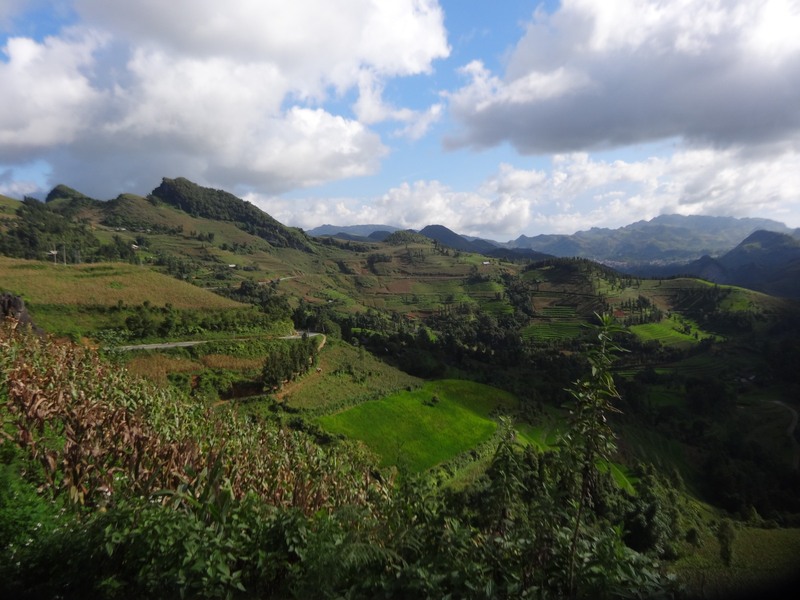 Would you rather hang around in the backpacker hostel instead of exploring this countryside? In the same night, while lying in my bunk bed, I reflected about this. Was it that I was looking for companionship as a solo traveler? Was I looking for recognition? For inspirations or even for girls? 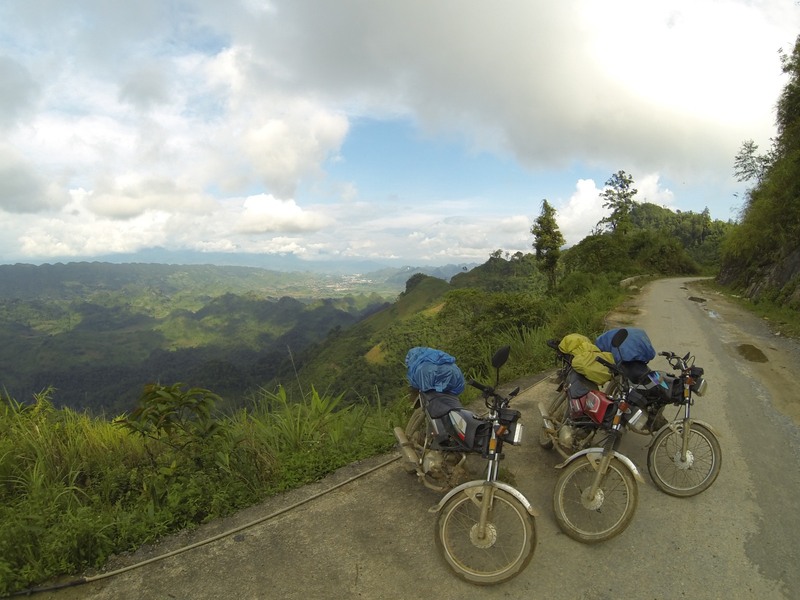 It was true, in Thailand, Laos or in Cambodia I met some incredibly inspirational and cool guys in Hostels, like Dirk, Simon, Sam, Max, Ianna and a couple of others. But with the majority of the beer pong playing guys and gals I really couldn't identify with. Did I think I was something better? No, I realized that it simply isn't my cup of tea to hang out 3/4th of one's available (but precious) time in the hostel, while all around you an amazing countryside invites you to explore it. It was here in Phong Nha where I saw young backpackers spending whole days in the hostel to update their Facebook status on comfy couches, playing pool and drinking cheap booze. Was this really all there is....? The next day I headed to boat pier of the popular Phong Nha water cave. 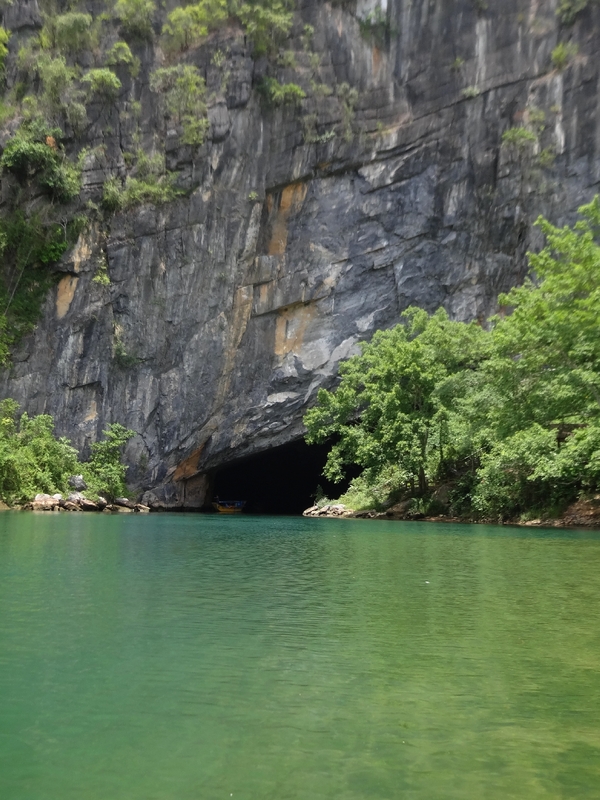 A regular visit to the cave consists normally of booking a boat at the pier, taking a boat ride on the river and finally into a river cave which marvels visitors with their incredible interior limestone stalagtites. At this time of the day I seemed to be the only one around to get on one of the boats. I asked the lady at the ticket counter if a boat could be also chartered for one person alone, and she said that it would be possible as long as I'd pay for the whole boat. Just at this moment another guy in a hurry suddenly showed up, and offered me to share the boat fare with me. Since he was another solo backpacker with limited resources I agreed, and thus indirectly started one of the best parts of my whole trip. The guy in the same age introduced himself as Patrick, a German from the region of Hamburg. 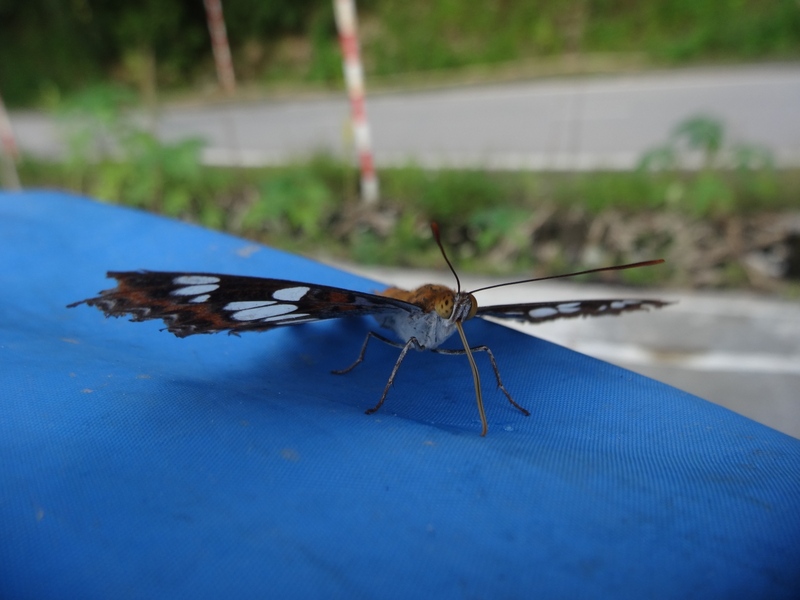 Just like me, he was on a South East Asia trip for several months. 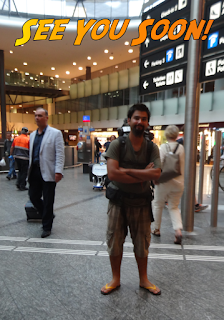 As soon as he realized I spoke German too, he turned out to be an extremely sociable and talkative fellow. 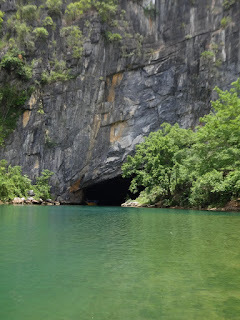 As we sat together in the boat in the direction of the cave, we didn't stop talking to each other and almost forgot the environment around us. ... which eventually lead us to this grotto. The Phong Nha grotto is by far the most popular cave in the park, making it one of Vietnam's most iconic sightseeing location for foreign and even domestic tourists. 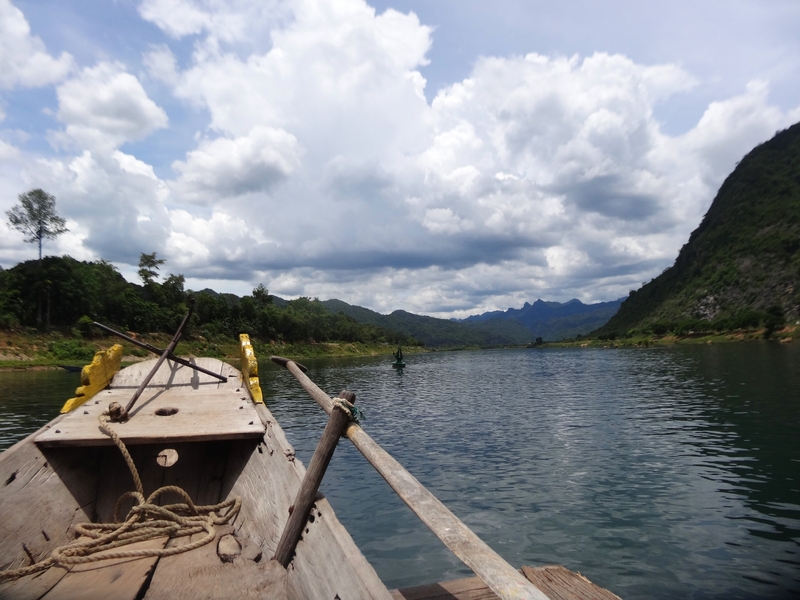 But luckily this day there weren't many other boats on the river, thus making it a much quieter experience. 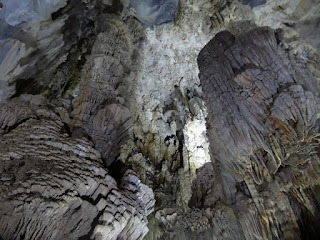 .... stalagmites inside the Phong Nha water grotto. This otherwise quite hyped excursion turned out to be quite entertaining and worthwile. 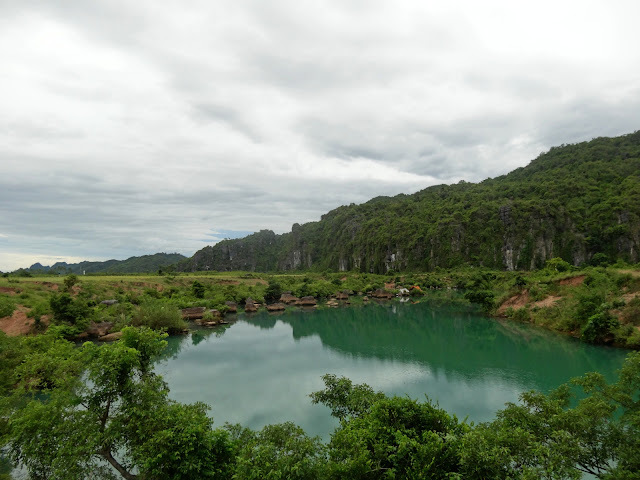 Apart from the experiences from the cave, we talked on the way back about the above mentioned problems with other backpackers and how much potential gets wasted if you only walk on the "beaten track". It turned out that Patrick was one of those many guys who also bought an old motorbike in Southern Vietnam and rode up all the way to Hanoi. In the evening he proceeded to tell me some of his wild stories and adventures. 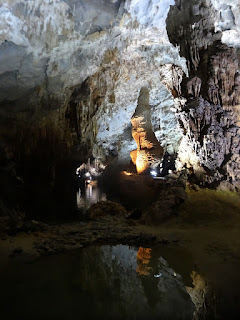 The next day we met again to pay a visit to Thiên-Đường cave, in English also known as Paradise cave. I rented a trusty scooter from the hostel and from there it took us about 20 minutes to get to the actual cave. Again, I was amazed by the beauty of the limestone countryside and the scenic roads. 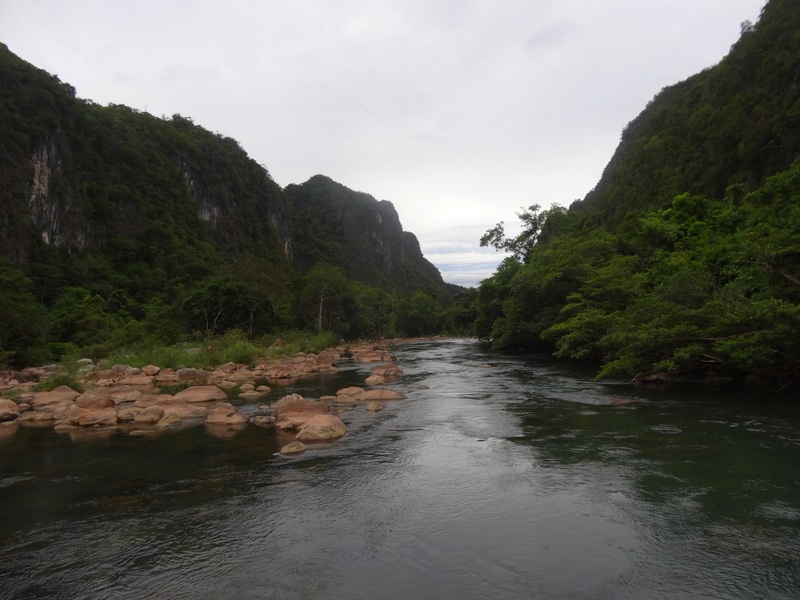 On the way we stopped by Suối Nước Moọc as well, a local river bath including a small trail and stunning visuals. Once more, and absolutely stunning countryside following the roads in Phong Nha. After this once more stunning day we settled back to the backpackers hostel. Again we discussed about the advantage of owning a motorbike when it comes to exploring Vietnam. 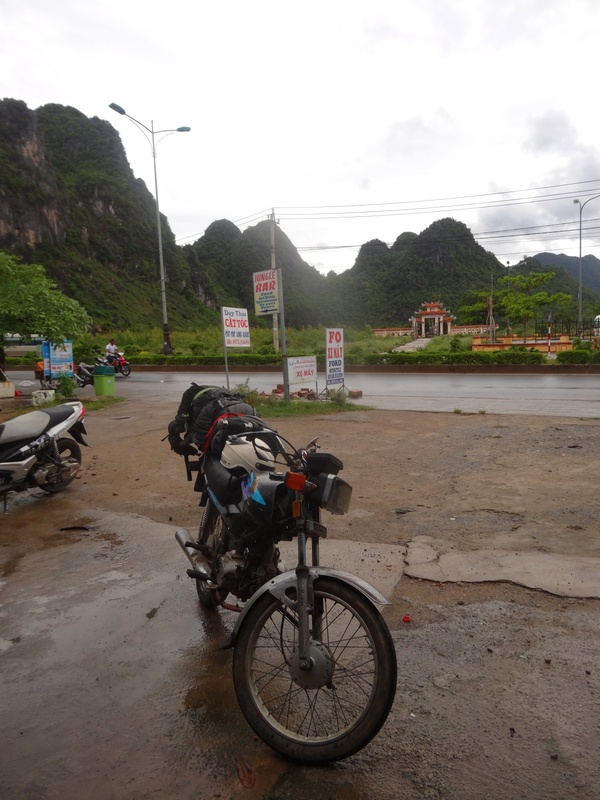 Although I rented a motorbike here and then, to that day I never thought of renting or buying a motorbike for a longer timespan and to road-trip Vietnam for weeks - the horror stories and thoughts of possible accidents or police checks only made it worse. 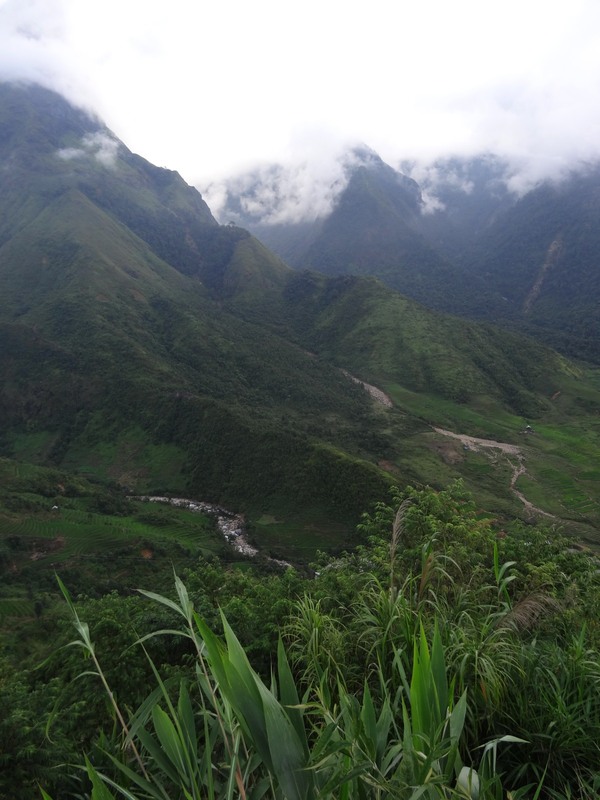 But after seeing the limestone mountains from the same day made it sure made me thinking. During the whole trip so far I kept reassuring myself that one day I'll come back and do the whole thing again on a bike. 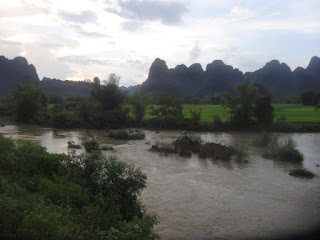 But on that very moment in Phong Nha I reflected what if I could never come back anyway? What wonders and adventures would I miss? At this point Patrick simply suggested: "Why don't you just buy a bike from the shop next door and ride along for a while?" First I couldn't quite grasp the realities behind that question and waved off in disbelief. But he was serious. "No seriously, let's go to the bike shop tomorrow and see what we can do." The next morning we seriously went there and after 10 minutes of talking and handing over about $150 in cash I was already an owner of a 110CC Honda Win. The "Win" is basically a scooter with the appearance of an offroad enduro, of course full of junky Chinese parts. That's how it works in Vietnam. It was from here where my Vietnam trip started to be one of the most exciting experiences of my life so far. After a quick introduction into manual bike transmission and basic maintenance tips, we were ready to go. ... over the magnicifent Ho Chi Minh Highway. 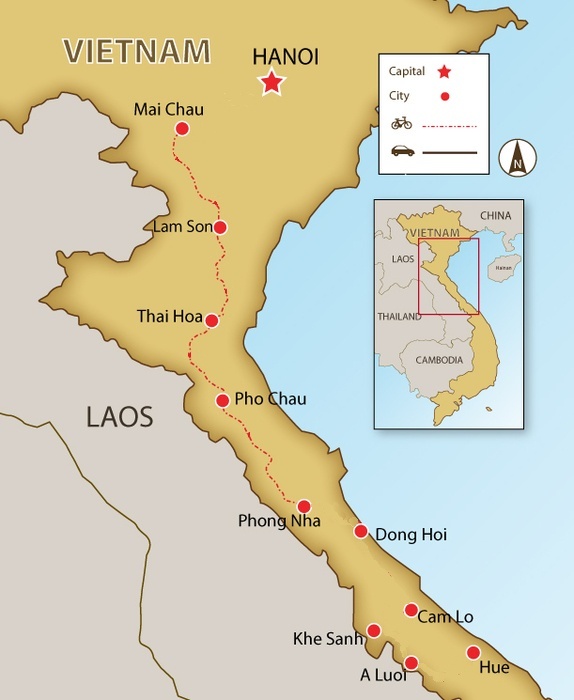 The Ho Chi Minh Highway, not to be confused with the historical Ho Chi Minh Trail, is one of the most iconic main roads that connects Central to Northern Vietnam. Unlike the dusty, noisy and dangerous Highway 1 along the coast, the HCM Highway is much safer, quieter and especially more idyllic option to head north. 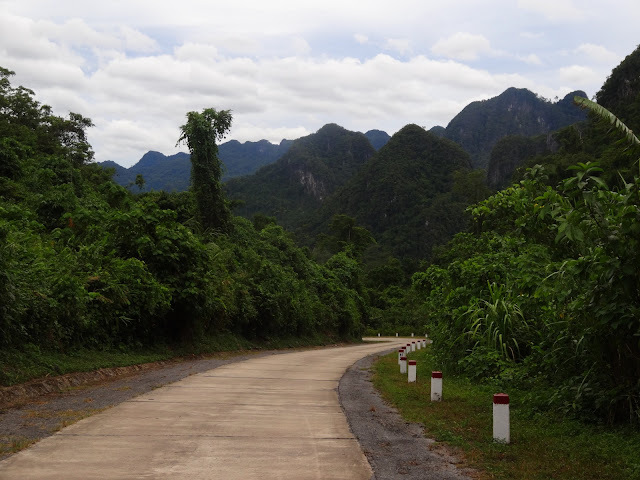 The road passes by enormous karst stone mountains and dense jungles. 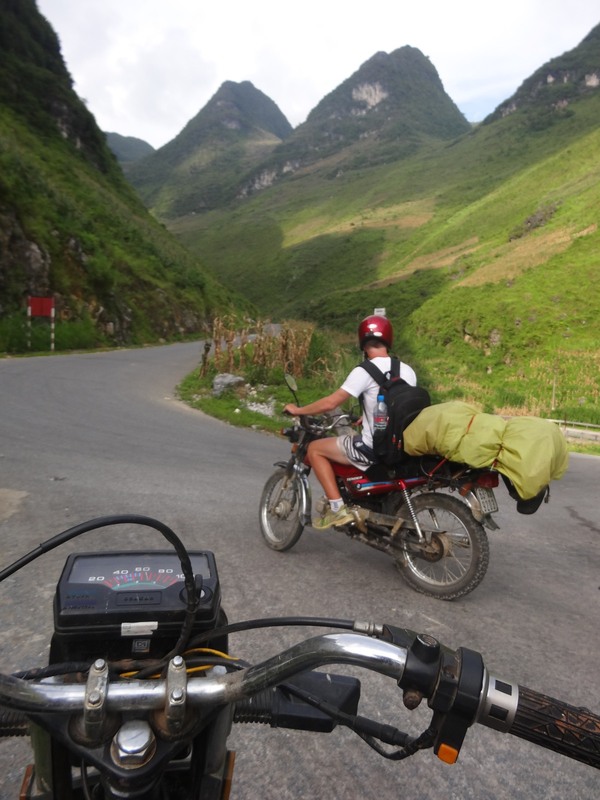 After already one day on the road I was already convinced that motorbiking Vietnam on a long term has lots of advantages. 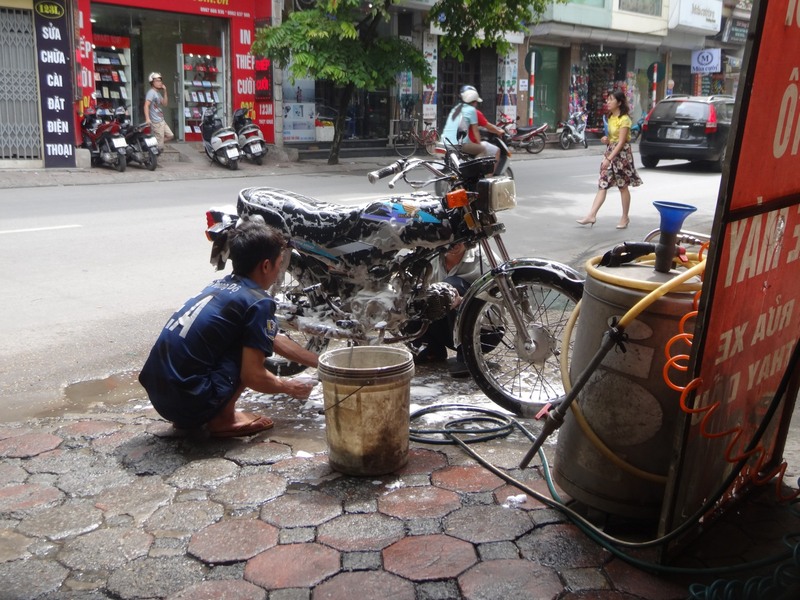 First of all, since Vietnam is a motorbike society you'll never have Problems finding cheap gasoline or bike repair shops. Every few Kilometers you'll find a Rua Xe shop, that's how bike garages are called. Furthermore there are lots of accomodation and food options along the road. 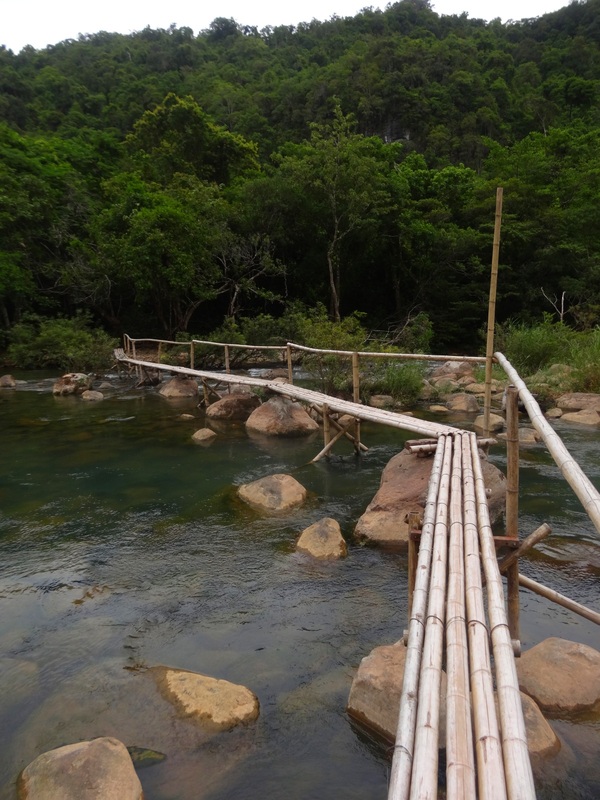 Especially the so called Na Nghi guest houses are worth mentioning, which are cheap, of formidable quality and vastly available. 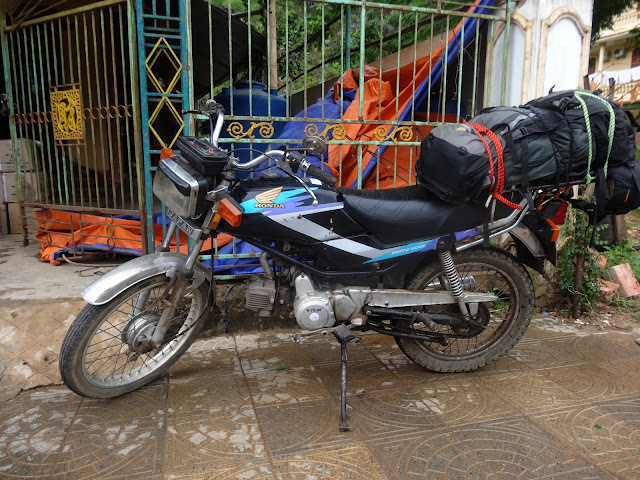 And finally, and most important, with an own motorbike you have the ulitmate freedom of exploring the country by yourself. You'll pass villages no other Tourist ever visited before, you'll embrace local life like never before, since you're becoming part of it (at least on the road that is). 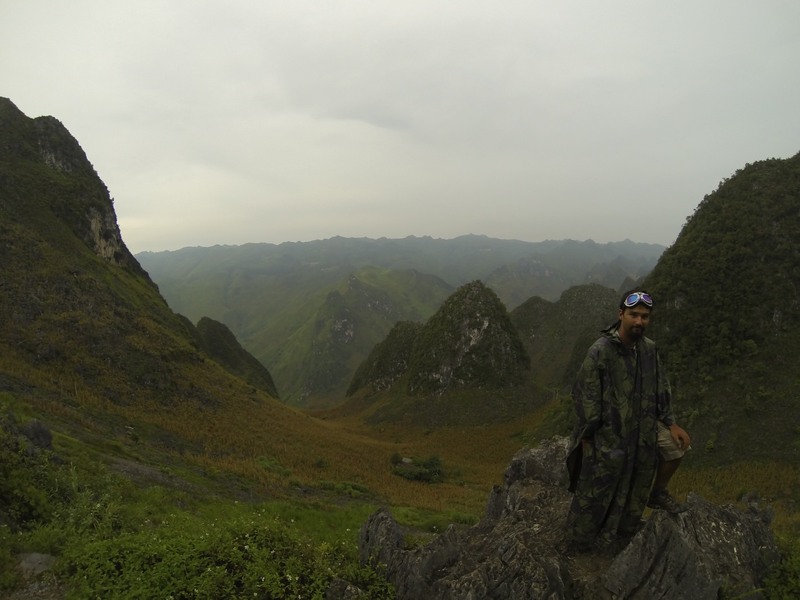 ... to the unpredictable yet beautiful nature of Northern Vietnam. After already the third day my bike turned out to be quite an annoyance in terms of mechanical problems (you get what you paid for...). 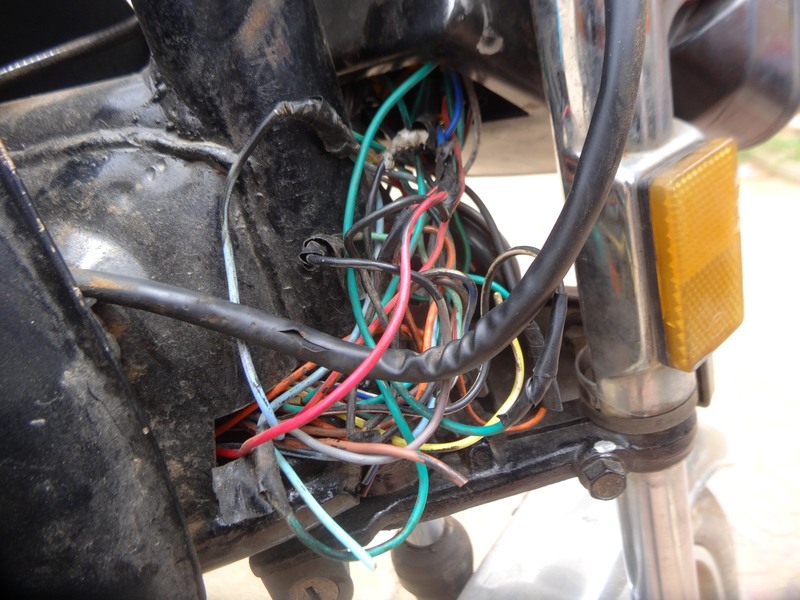 In a timespan of about 7 days I had to change the bike chain, transmission gears, break cables, the rear and front ligths, and some other stuff. But luckily enough bike repairs are always pretty cheap in Vietnam, even when foreigners tend to pay more than locals. 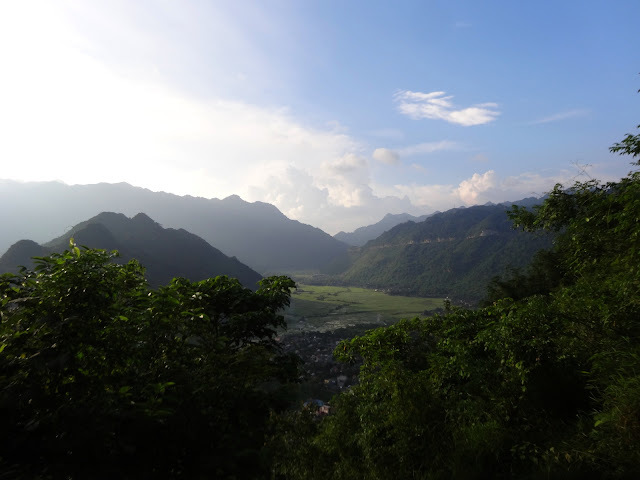 After a couple of days Patrick and I arrived in Mai Chau, an indeed scenic town in the middle of a green valley full of rice paddies. 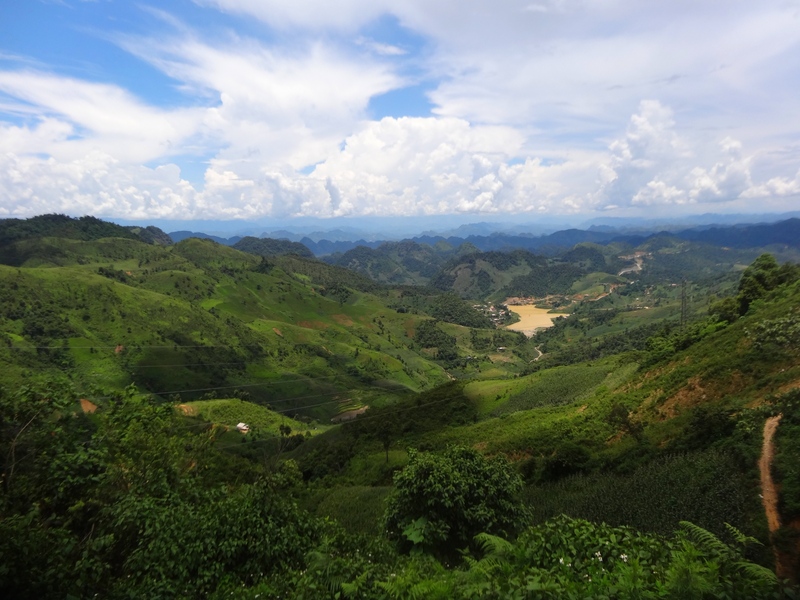 It was from here on where the the beauty of Northern Vietnam began to fully expose to us. ... was daily routine since the day we passed by Mai Chau. 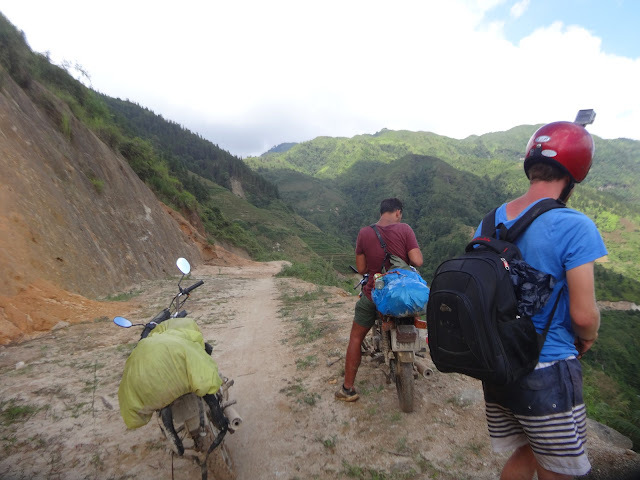 In Son La, a couple of kilometers north-west of Mai Chau, we accidently met Lukas, another German guy who traveled on his Honda Win. 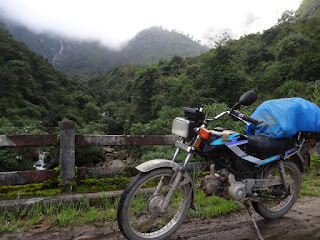 He joined our motorbike gang and from here the trio rode onwards to unknown (mis-)adventures. 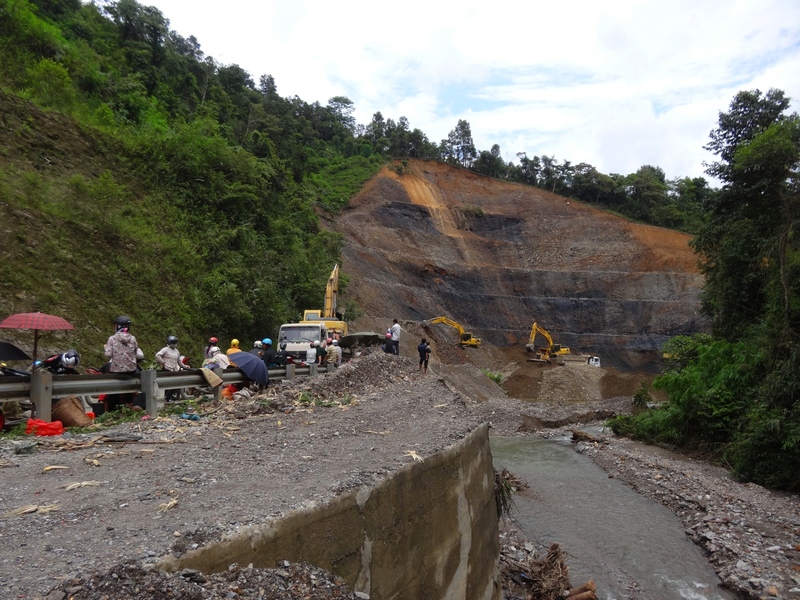 ... one of many road construction sites. 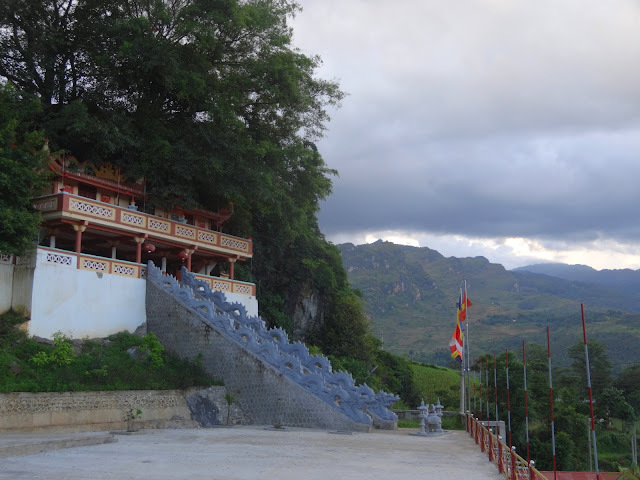 We also made a Brief stop-over at Dien Bien Phu, a place of historical importance. 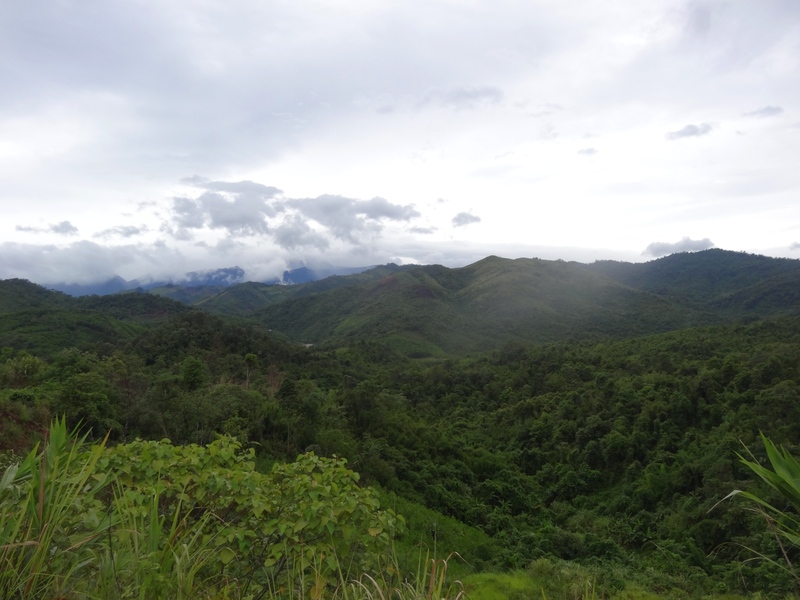 It was here where the French were beaten in the iconic Battle of Dien Bien Phu. Unfortunately our tight itinerary didn't give us much time to see all important sights and museums in the Region. 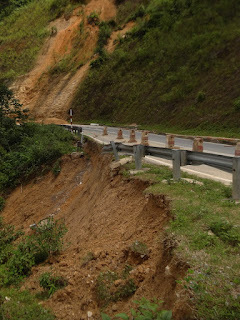 ... we encountered an indeed nasty road section. 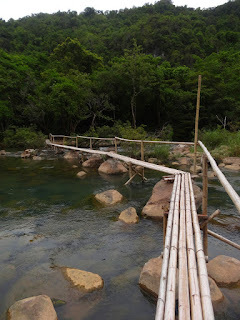 ... the actual tourist town of Sapa was not too exciting. 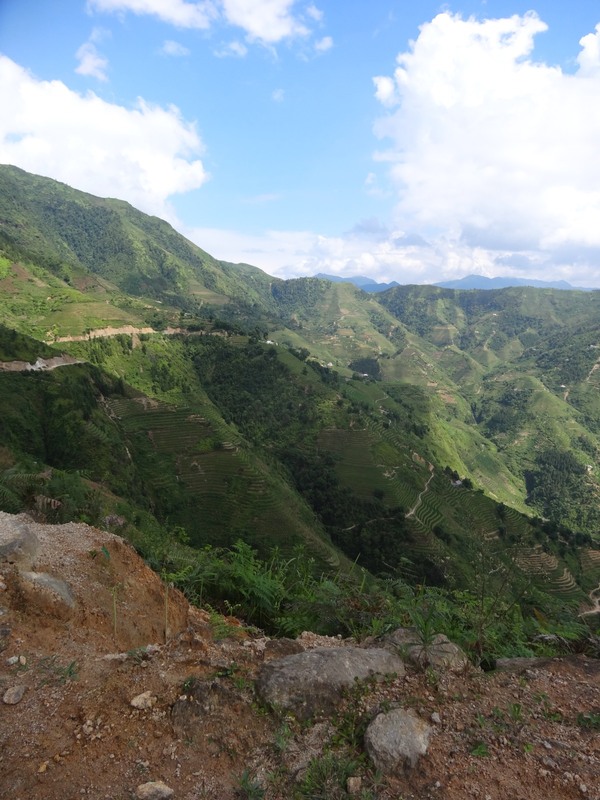 Sapa is pretty much the most touristic place in Vietnam's far North. 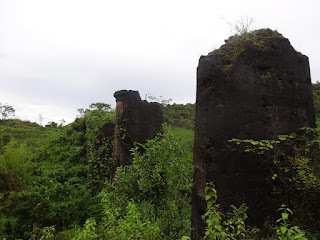 Throughout the years it became famous because of its trekking and homestay options, but even if the nearby surroundings are indeed beautiful, it surely lost a lot of its authenticity from back then. 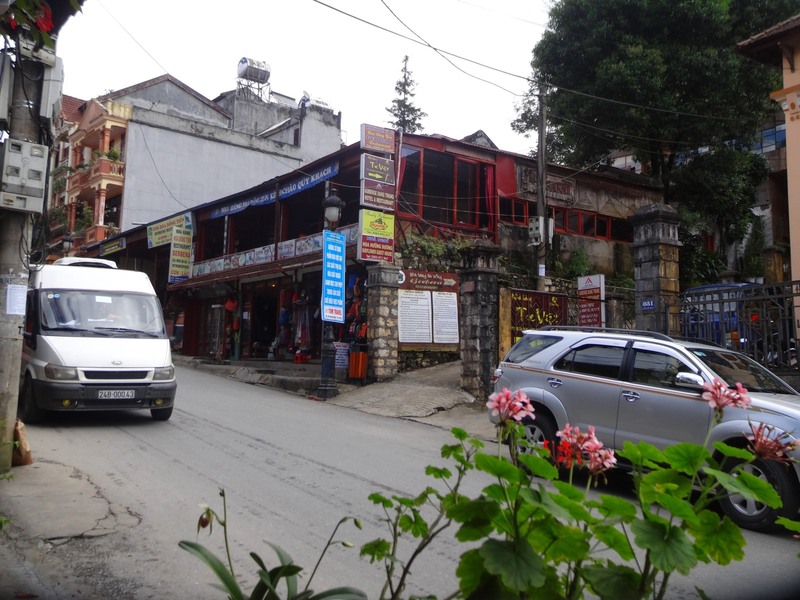 But even if you're not too much into touristic places, Sapa is still worth a stopover due to its good restaurants (the local ones, not the Tourist rip-off places). 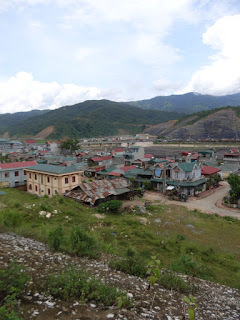 A couple of kilometers east of Sapa we drove by Lao Cai, one of Vietnam's bigger cities in the far North and also an important border town to China. It was indeed a special feeling taking a look over to the "other side". 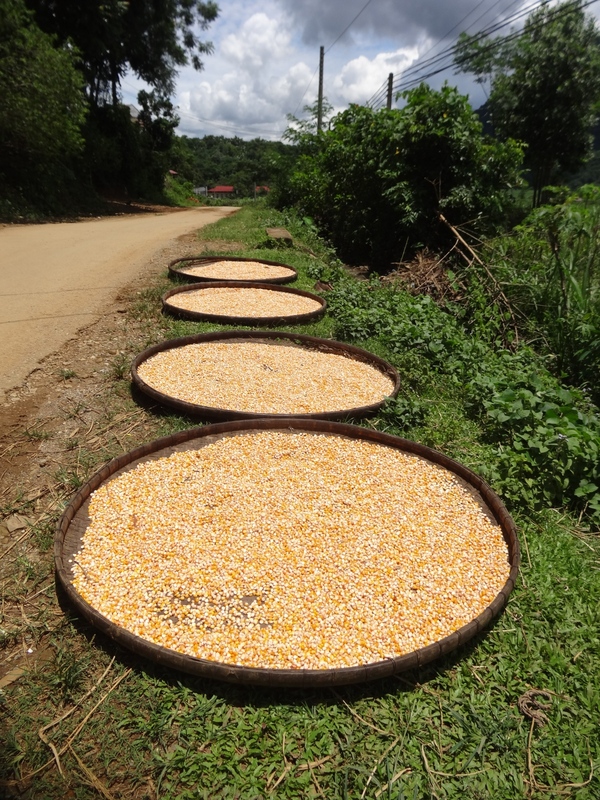 After this part of the road began one of the most adventurous sections of our Honda Win trip. We three guys remember it simply as the "You know, the Hoang Su Phi part". 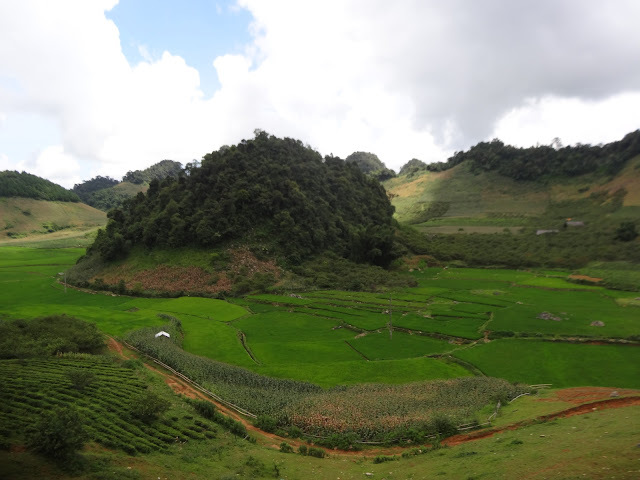 It began with losing ourselves somewhere in mountain rice paddies somewhere between Bac Ha and Vinh Quang / Hoang Su Phi. 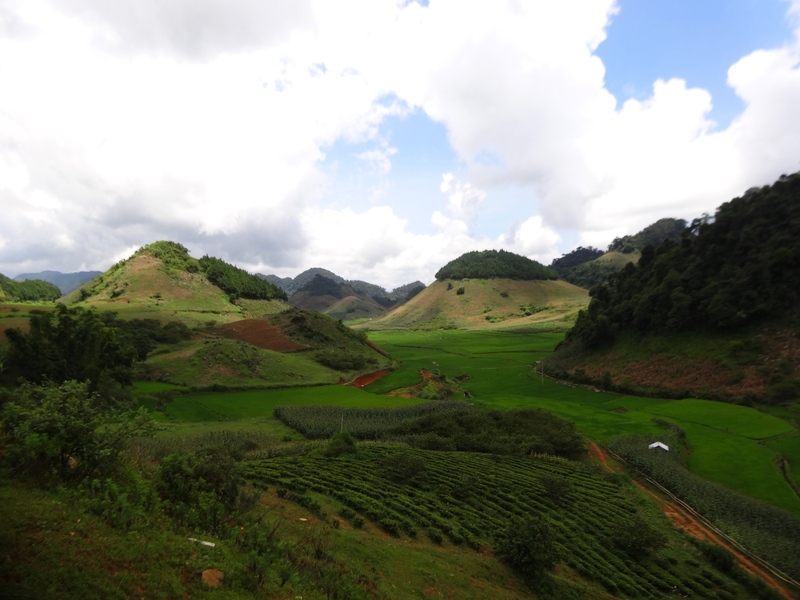 Somewhere in a godfarsaken place between Bac Ha and Vinh Quang. At least that doggie looks happy. The official way (blue) looks so safe and boring. 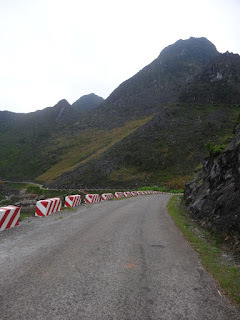 Why not taking that red, dodgy looking route to Ha Giang...? 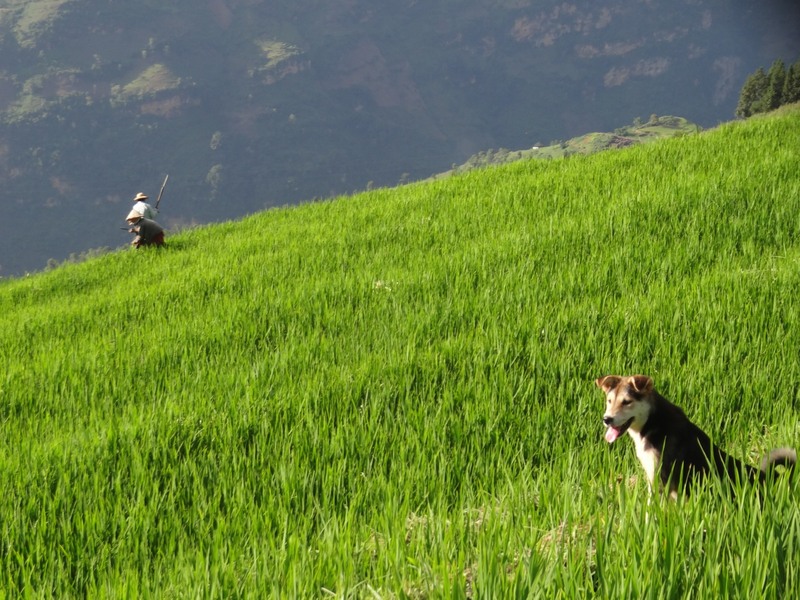 ... over a ridge above stunning Rice paddies. As you may imagine, the “road” was a complete disaster. After about 5kms the small paved road suddenly transformed into a small hiking path with some really steep slopes and even wild torrents blocking the way sometimes. 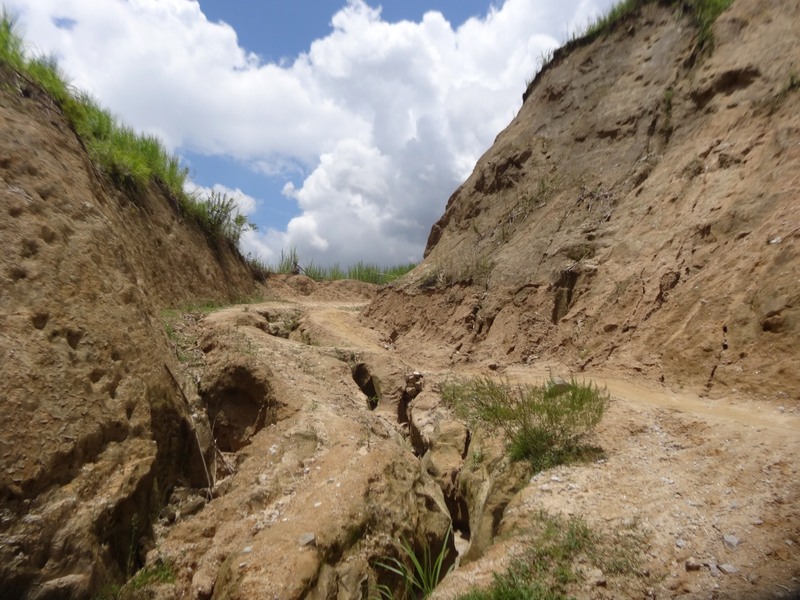 Partly the path was again and again interrupted by muddy pools and other nasty obstacles. 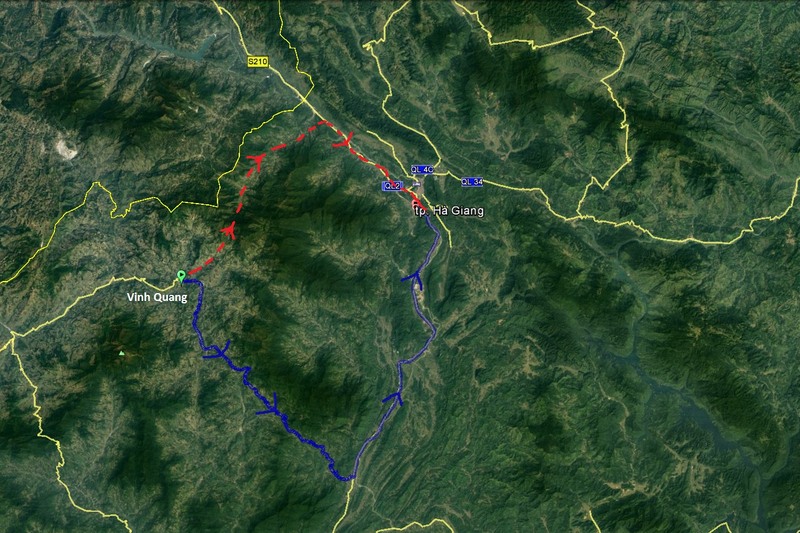 And as if this wasn’t bad enough, the road directions on Google Maps were completely wrong as well – according to our GPS were were driving somewhere in the green. The local hilltribe people who lived there just kept staring at us like we where ghosts. 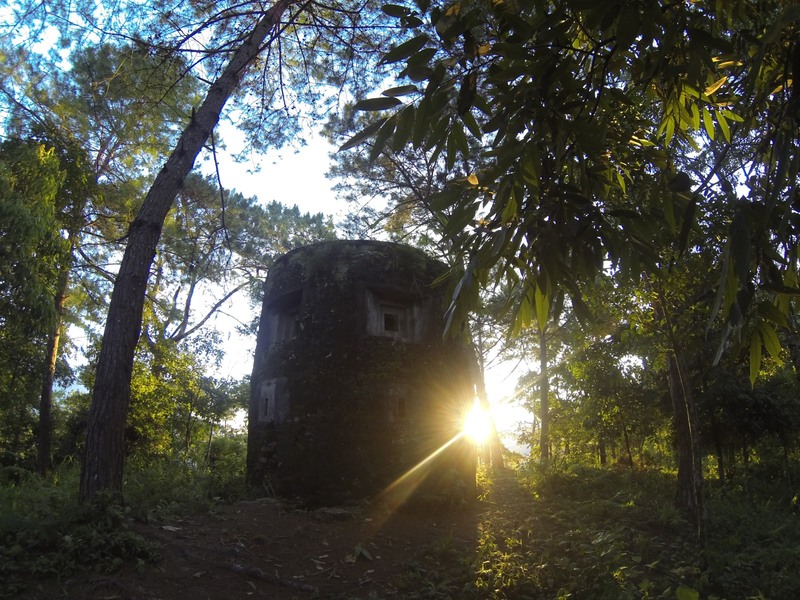 At least we found by accident an old French bunker well hidden on a bamboo-infested hill just next to Vinh Quang. 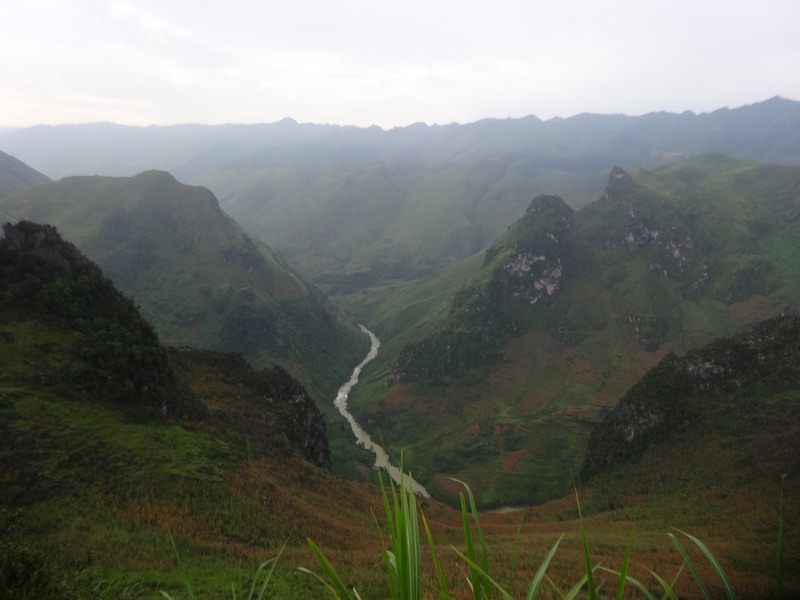 The next day we safely arrived in Ha Giang (this time over the "recommended" route) and tackled the legendary Dong Van Karst Plateau. 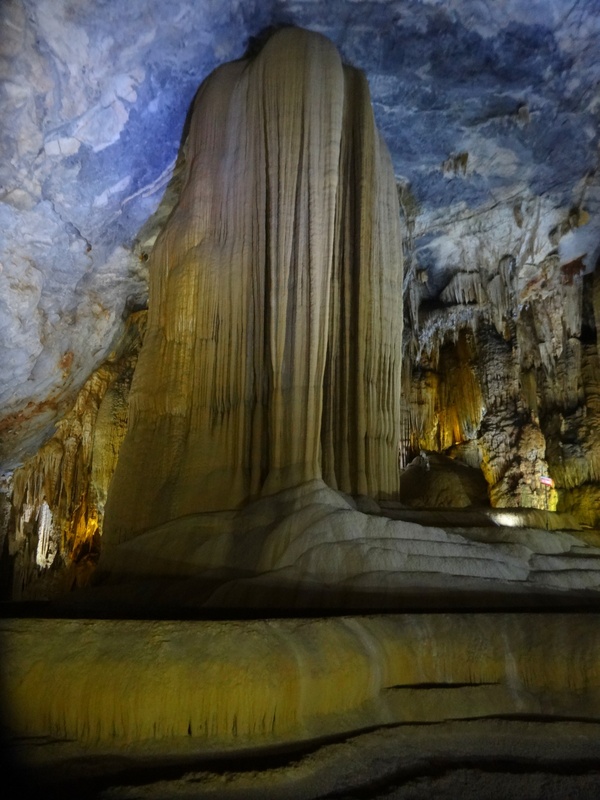 This geopark is a famous border area next to China and famous because its karst mountains, passes and remote village. 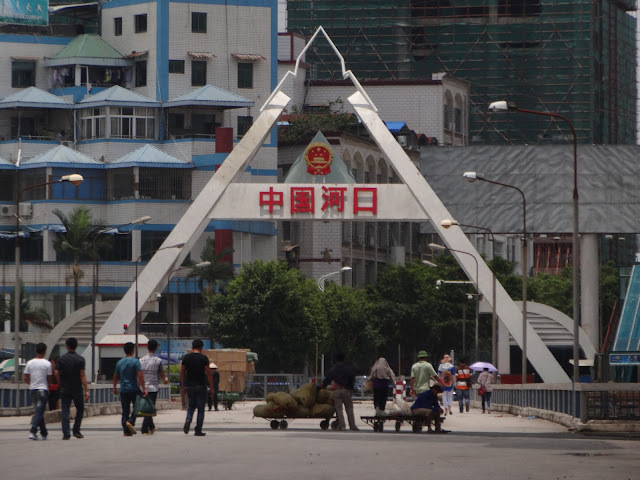 Before entering the geopark we had to buy a border permit at the local Immigration Office in Ha Giang, which allowed us to move inside that border area. 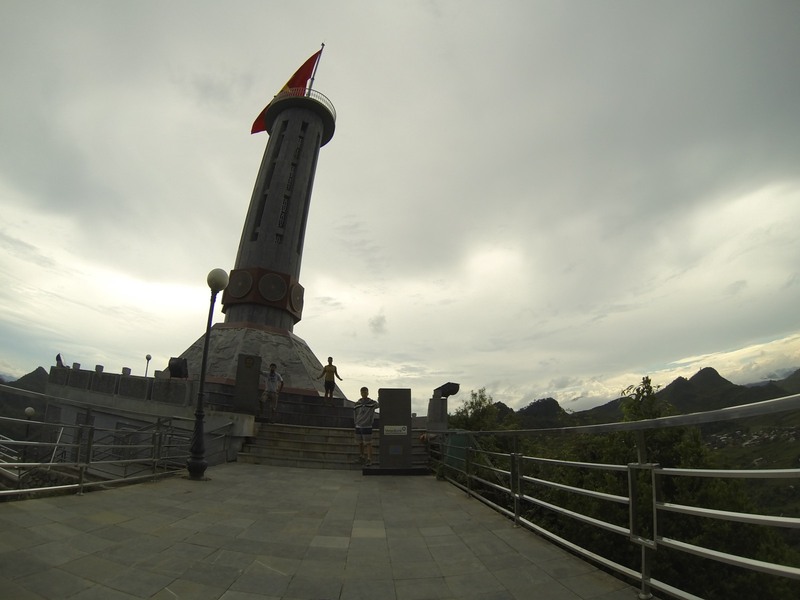 From the town of Dong Van you can also reach the most-northern point of Vietnam, the Lung Cu flag pole. 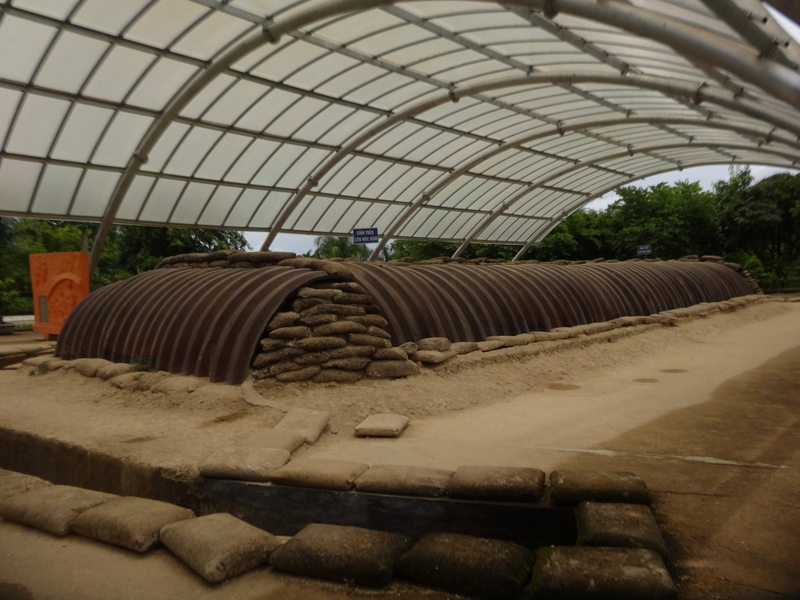 Just a stone's throw distance away was the vasteness of China Mainland, but that would be a Story for another day. From Dong Van we tackled the so called Mapileng Pass - apparently one of Vietnam's most scenic and monumental mountain passes. 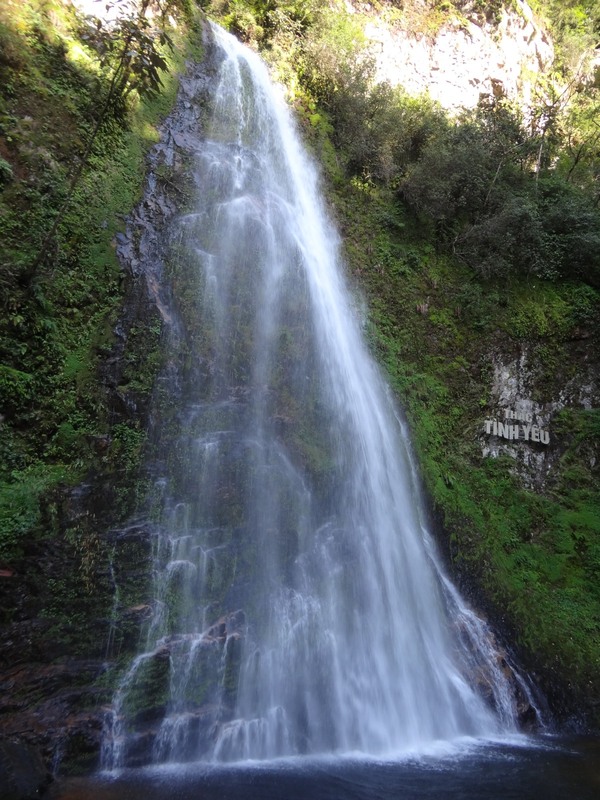 This was definitely one of the bike trip's highlights by far. 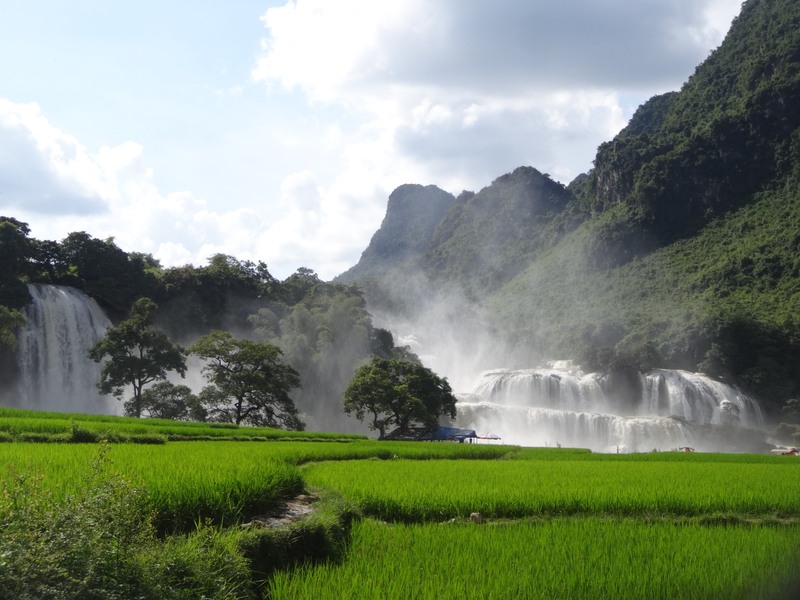 You simply can't find such breathtaking places in the south of Vietnam. ... the awesomeness that Mapileng Pass is. 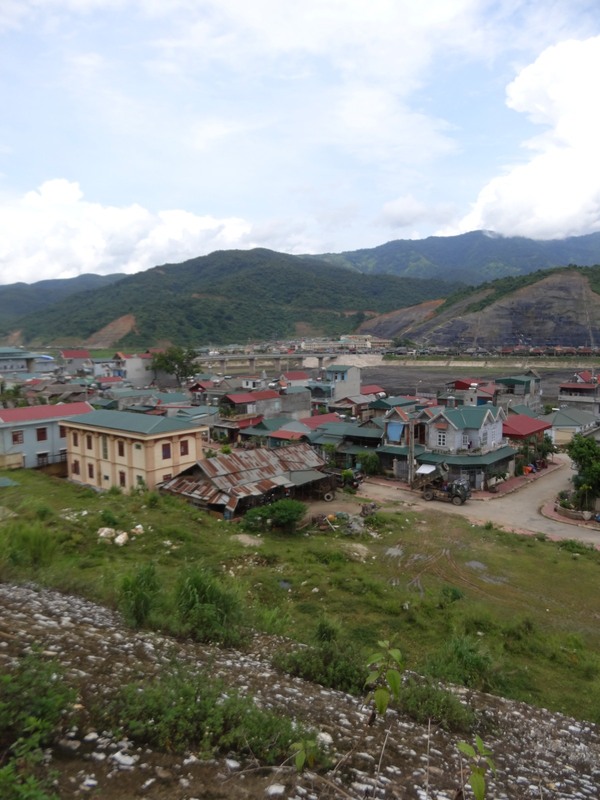 After another brief stop at the market town of Meo Vac, we continued our way to Cao Bang province. 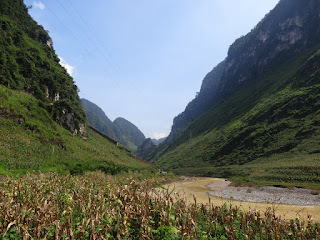 The climate got again more humid and warmer, and from vast rice paddies huge lime Stone mountains towered into the sky. That's how I imagined Vietnam in my dreams before coming here. 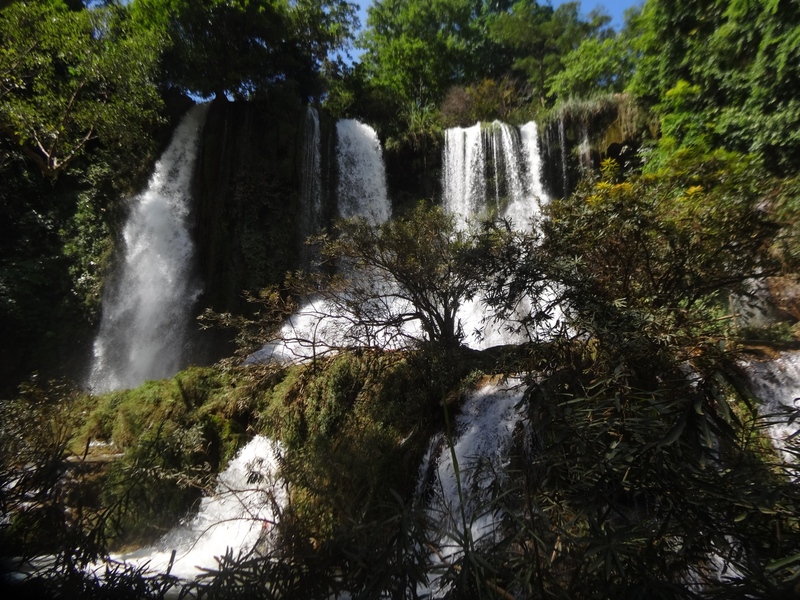 Cao Bang especially delighted us with its majestic countryside, the iconic Ban Gioc Waterfall and also because of the Nguom Ngao cave, of which I don't have taken any good pictures unfortunately. If you are traveling around this Region, I highly recommend you to visit Ban Gioc Waterfall and Nguom Ngao cave on the same day, since they are about only 15 minutes away from each other. 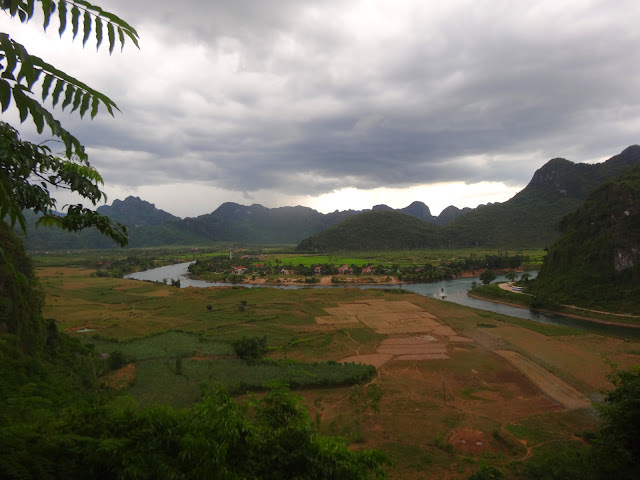 After Cao Bang we first thought about going to Haiphong first, since that would be a good starting point to visit Cat Ba Island and Halong Bay. But when riding the next day we realized that weather ultimately got catastrophic - according to online weather reports heavy continuous rain was expected for the next few weeks. 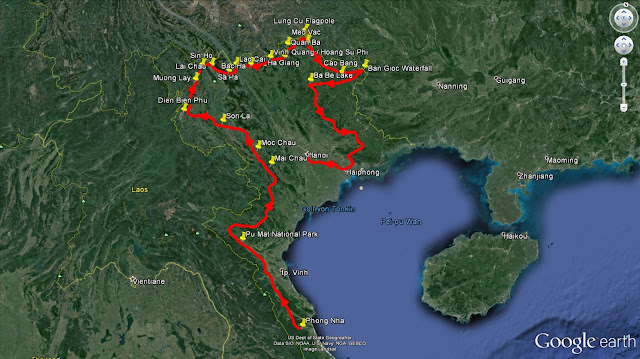 Therefore we decided to skip Halong Bay completely and to head over Hanoi directly. Hanoi was a thrilling and lovely Metropolis full of things to explore. 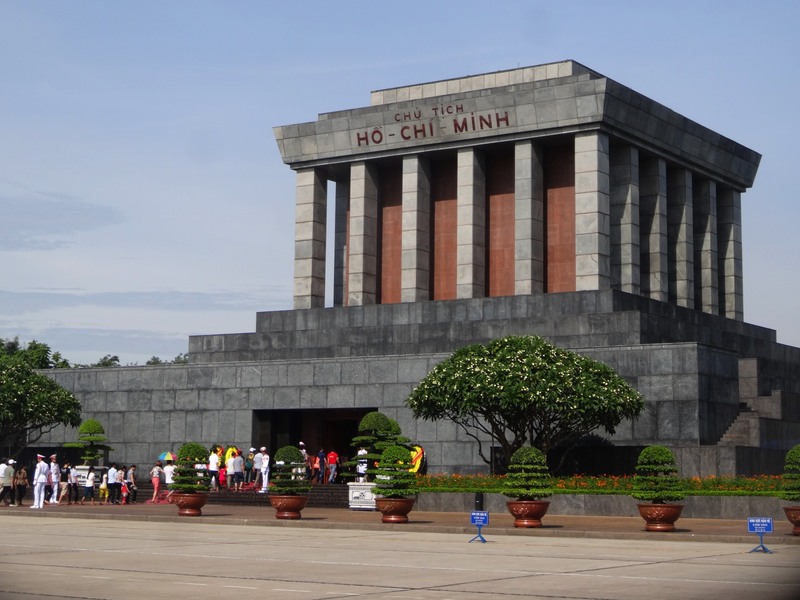 During our last days in Vietnam we enjoyed exploring the many museums and corners of this mega city. 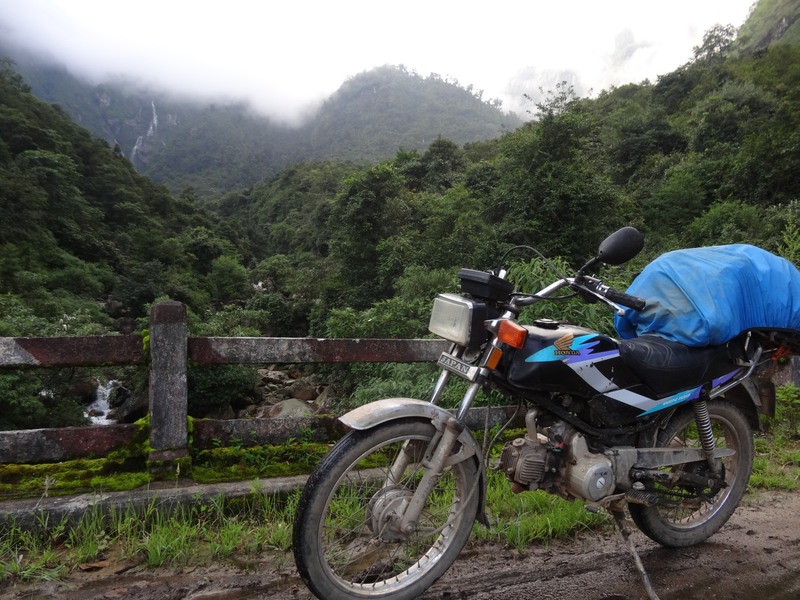 We also sold our bikes to other backpackers, who then started their own Honda Win trip by themselves. As we were sitting in the Lighthouse Bar, the bar with the longest opening hours in Hanoi, we three guys reflected about our motorbike trip - it was one of the most epic and adventurous things we had done to date. 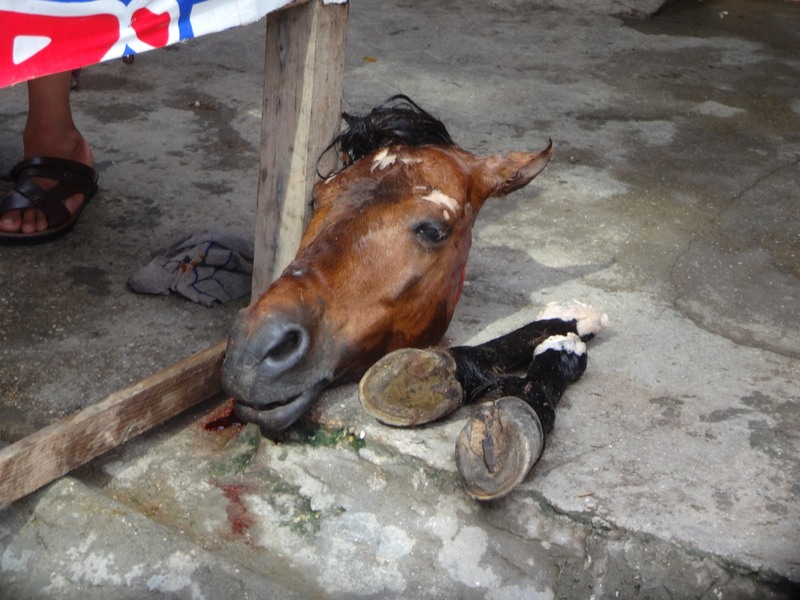 Of course we were well aware of the risks that we were confronted to during our ride, but we were cautious enough to look after each other and not to take any unnessecary risks. We definitely agreed that it was worth every second and penny we invested in. Is it therefore something I'd recommend to anyone? Not quite. 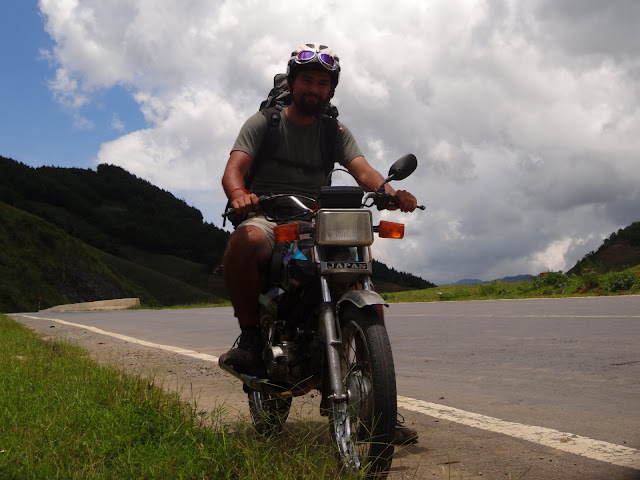 If you aren't too confident on riding a bike in South East Asia or if it is your very first time on a bike, then I'd rather start practicing with rental motorbikes in other South East Asian countries first. 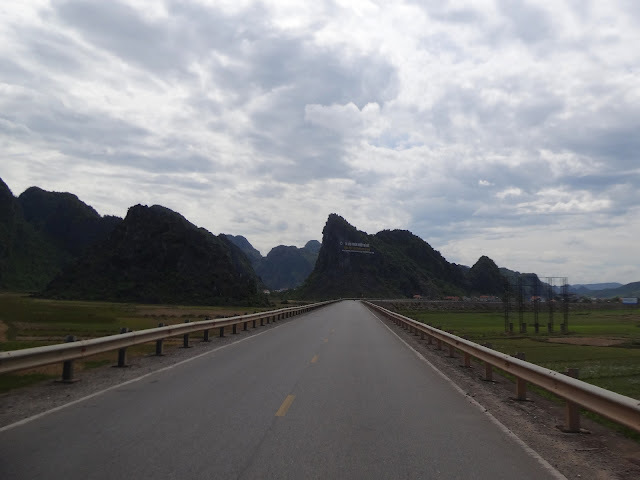 It's also noteworthy that the traffic on Vietnam's busy highways can be pretty crazy. 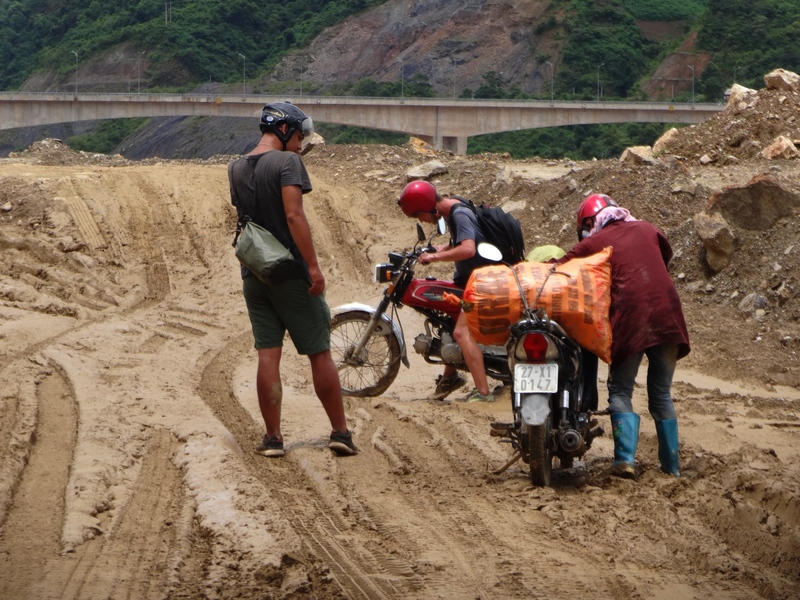 When riding Vietnam it is for example very important, to avoid Highway 1 under all circumstances. 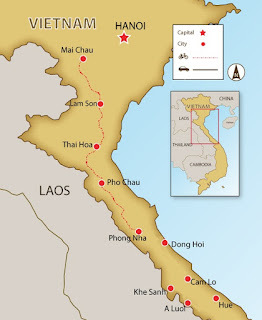 Rather ride along Vietnam's main roads through the green countryside, such as the Ho Chi Minh Highway. It's much more scenic, more quiet, more rewarding and, most importantly, safer. You can find good advice on motorbiking Vietnam on Blogs like Vietnam Coracle or videos such as this one. 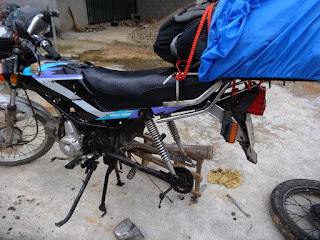 Before doing a motorbike trip like I did, first do some research about basic bike maintenance in Vietnam, where to buy bikes (for example craigslist or travelswop) and what routes you want to take. 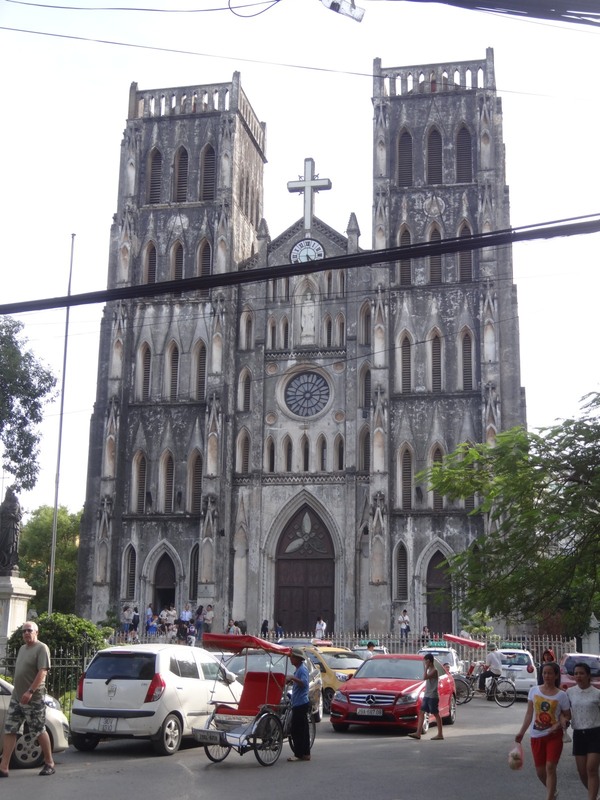 Also make sure to read about insurance, current traffic laws (international driving licence in Vietnam) et cetera. Keep in mind that anywhere in the world something could happen, but don't let ill thoughts spoil or even cancel your planned trip. Be positive and look forward to a unique experience! It was here in Hanoi where my 6 and a half months trip through South East Asia ended - but it wouldn't be the last time I visited Asia. As I sat in the plane heading back to Zurich, I again let all the memories pass through the window. It's absolutely incredible what one can experience in such a short timespan and what life lessons can be learnt. That's what traveling is all about.